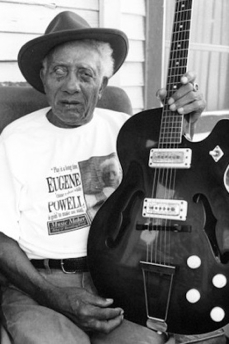 Vocal Planet blues singer Eugene Powell was a true blues legend. We were very privileged to record him when he was 90 years old, just shortly before his death. Eugene's story begins in Utica, Mississippi in 1908. He was the product of an inter-racial affair between his African-American mother, who worked as a house servant, and a white man named Emmitt Powell. Eugene hardly ever saw his father as he and his mother lived on a plantation outside of Shelby, Mississippi. As a young boy, Powell was involved in an accident with a bow-and-arrow which left him blinded in his right eye. At the age of seven, Eugene's mother purchased a guitar for him through the Sears Roebuck catalog for the price of $3. Powell told us that it took him just three days to teach himself how to play the instrument. One thing is for sure, he was such a capable musician by this age that he began to work as a novelty act playing at picnics, and even entertained the guards and prisoners at the nearby Parchman Farm. It was said that many of the prisoners were so taken by the talent of such a youngster that it often left them with tears in their eyes. Eugene waxed his first recordings for the Bluebird label in 1936, at the St. Charles hotel in New Orleans. At this session, Eugene made six recordings as Sonny Boy Nelson - after his stepfather. At that time Eugene made his living sharecropping but also operated a roadhouse where he would earn money gambling and selling bootleg liquor and homebrew. He pursued his love of music throughout the delta. Powell played many instruments including banjo, violin, harmonica, horn, and guitar, but he played lead guitar most of the time. His guitar was a Silvertone. He inserted an aluminum resonator into it like those found on the National guitar. He also fitted a seventh string, using the twelve string model as his inspiration. His playing style stood out as one of the greatest Blues soloist of his time. Changes in musical tastes can be fickle and following WWII, many acoustic Country Blues artists were no longer in favor. Many of these artists have been lost forever; yet, a select few found resurrection during the Blues Revival of the late-50s and early-60s - which carried Eugene to the Festival of American Folklife in Washington, D.C.
Eugene's tunes like " Street Walking Woman," "44 Blues," "Suitcase Full of Trouble," along with "Meet Me in the Bottoms" are forever forged in blues history. In 1978, Powell participated in the documentary film by Alan Lomax, "The Land Where The Blues Began". He was also a featured subject for the book, "Mississippi Triangle" by Worth Long and in an article printed in National Geographic. By 1990, Eugene Powell's health began to deteriorate; yet he still continued to perform. His playing inspired many Bluesmen, and toward the end of his life, younger musicians such as Lonnie Pitchford, Keb' Mo' and Alvin Youngblood Hart all acknowledged influences from Powell. His headstone reads, "Guitar virtuoso, his music touched people the world over".